Yes, I know: certain medievalists have been impersonating cool people as of late. My own theory is that you can dress in a leather coat and sophisticate your coiffure, you can don your skinny jeans with a Hugo Boss suitcoat and Hermès tie, you can sip martinis while everyone else is swilling beer ... but medievalists are geeks at heart. Why else would anyone learn Latin AND Provencal AND Old Norse? Last night I went to see The Lord of the Rings: The Two Towers on an outdoor screen, accompanied by live orchestra and huge choir. The performance was staged at Wolftrap, a national park not far from DC. From the banging of the snare drum to the swell of the violins to the unbelievably talented soloists, the event was so great -- and the enthusiasm of the audience added immensely to the experience. The night was stormy. We were drenched by the time the film concluded. Yet the lightning and the wind and the moon behind the racing clouds were perfect atmosphere for the battle of Helm's Deep. OK, there it is: I saw The Two Towers with orchestra and choir and LIKED IT. I am a nerd, move on, there is nothing more to see here. Jeffrey, geeks and nerds are not the same thing. Geeks go to conventions. Nerds go to conferences. Based on this example, I'd say you're a nerd with geek tendencies (since geeks tend to love movies like LOTR ... especially if they can play dress up or learn a made-up language, etc.). There's nothing wrong with that, of course. It's just important to get the facts straight. I *do* like martinis and own one [but only one] Hermes tie. Otherwise, I am *not* cool. 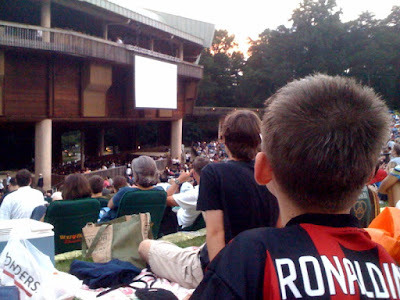 I wish I had been there at Wolf Trap [the last time was to see Ella Fitzgerald just before she died], a great venue! Does it make me a nerd if I am jealous that you went? Yeah, probably.